The exterior of Fox Studios is pictured, March 19, 2019, in Los Angeles. 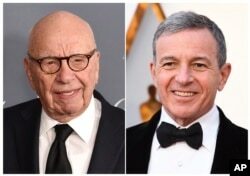 FILE - This combination photo shows Fox News chairman and CEO Rupert Murdoch at the WSJ Magazine 2017 Innovator Awards in New York, Nov. 1, 2017, left, and Disney CEO Bob Iger at the Oscars in Los Angeles, March 4, 2018. Some parts of Fox, like the John Landgraf-led FX and Fox Searchlight, the specialty label overseen by Stephen Gilula and Nancy Utley, are expected to be kept largely intact. Searchlight, the regular Oscar contender behind films such as "12 Years a Slave," "The Shape of Water" and "The Favourite," could yield Disney something it's never had before: a best picture winner at the Academy Awards. Workers put up a poster for the upcoming FX limited series "Fosse/Verdon" near the entrance to Fox Studios, March 19, 2019, in Los Angeles. "I don't think it remotely arguers the end of the glories of the film business overall," says Rothman. "I believe there remains eternal appetite for original, vibrant, creative theatrical storytelling."